Deacon Walter Lee McClain, Sr. Celebrating the life of Deacon Walter Lee McClain, Sr.
Be the first to share your favorite memory, photo or story of Deacon Walter. This memorial page is dedicated for family, friends and future generations to celebrate the life of their loved one. 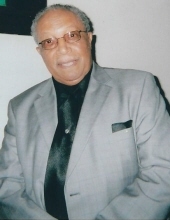 Obituary for Deacon Walter Lee McClain, Sr. This Online Memorial has been created to commemorate the life of Deacon Walter Lee McClain, Sr. Leave a message on the Tribute Wall to share your favorite memories and offer words of sympathy and comfort. To send flowers or a remembrance gift to the family of Deacon Walter Lee McClain, Sr., please visit our Tribute Store. "Email Address" would like to share the life celebration of Deacon Walter Lee McClain, Sr.. Click on the "link" to go to share a favorite memory or leave a condolence message for the family.